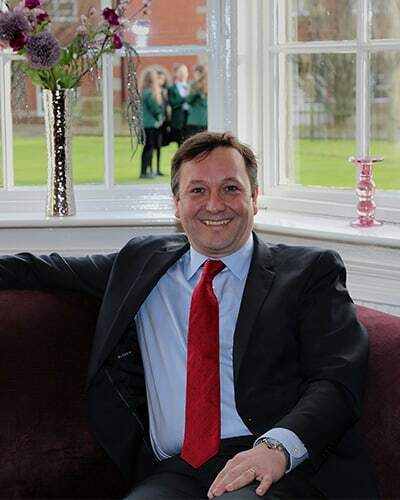 I started as Headmaster of Silcoates in September 2017, having taught at a variety of independent schools over the previous twenty-five years. My most recent post was as Deputy Head (Academic) at Reading Blue Coat School, where I was responsible for the structure of the curriculum and all the fun stuff like assessment, reporting and writing the timetable. I also taught both History and Government and Politics, which, to be honest, is something of a privilege because they provide great opportunities for storytelling, debate and argument about the big events that have shaped our world. When I was a child, I was never someone who thought I would eventually spend my professional life working with young people. I can’t say I loved school as such. From 7 to 18, I was a full boarder and school, in my mind, was always something quite austere and emotionally isolating. Perhaps to compensate, I threw myself into everything on offer and particularly enjoyed music and drama. This led me to play some fantastic roles, the most notable perhaps being that of the Coryphaeus in ‘Antigone’, which required me to learn several hundred lines of Ancient Greek. I was fortunate to gain a place at Oriel College, Oxford, to read Modern History. When I was at university, I wanted to have a career in the theatre. If truth be told, I would have loved to have been an actor but, with my parents thinking that would be far too precarious an occupation, I opted instead for something in theatrical marketing. Having managed to gain just such a post, I then realised how much I loved my subject and how I wanted to pass that knowledge onto others. I thus embarked on a PGCE in South Wales, where I did my teaching practice in a school in the shadow of Port Talbot steelworks. I was then lucky enough to be appointed at Whitgift School in Croydon and thus my career began. Teaching for me has always been about the relationship between myself and my pupils. Lessons must be fun, fast-paced and focused and pupils need to know what they are required to learn and why. The glue that brings everything together in my mind is the teacher’s enthusiasm and expertise and their ability to convey to each and every pupil how they can reach, and preferably exceed, their potential. But, more than anything, pupils need to be happy, in a school where everyone is treated as an individual but feels a strong sense of belonging to the collective whole. The same, for that matter, goes for the teachers and the support staff. I also strongly believe in the type of holistic education that Silcoates offers, where every child can find their own niche – or niches – whether that be sporting, artistic or elsewhere. I am married to Helen and we are the proud parents of six children. I am also now a Silcoates parent, which enables me to experience the School from a different angle. As you can imagine, the teachers are more than happy when I appear on the other side of the table at Parents’ Evenings! I have really enjoyed my time so far at Silcoates. It is a warm, friendly and happy school, where pupils of all ages participate and progress. Their achievements are remarkable – a tribute to them and their parents, as well as their teachers. I think we are special and hopefully this website will encourage you to visit us when you can. I endeavour to meet with all prospective parents when they come to the School for the first time and so I look forward hopefully to meeting you in the not too distant future.